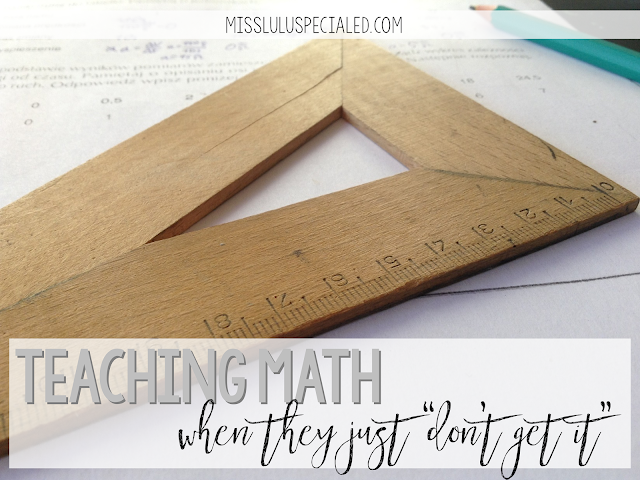 Teaching Math When They Just "Don't Get It"
I have a love/hate relationship with math. I hate doing it, but I love teaching it. I think I love teaching it because I want my students to learn it differently than I did. 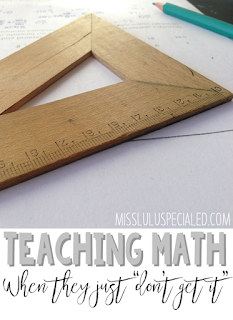 Teaching math in special education, specifically for students with significant disabilities, is like throwing darts while blindfolded and hoping that you hit the board. There is very little curriculum available and most instruction and IEP goals focus on functional skills, like telling time and counting money. Additionally, most special educators do not take any instructional math courses. On the opposite end, regular education teachers have very specific curriculum, time blocks, and standards for teaching math. But how can you use what you are required to use to help the students that just aren’t “getting it”? Here are some of my go-to strategies for struggling mathematicians. The great thing about these strategies are that they can be adapted regardless of the curriculum you are using and can be used for any mathematical concept or skill. Teach using a concrete-representational-abstract (CRA) teaching sequence. This teaching sequence is a research based approach that ensures that students have a complete, thorough understanding of the concept or skill. If a student first develops a concrete understanding of the concept, they are more likely to be able to perform AND understand the skill at an abstract level. Begin by modeling and teaching the skill using concrete materials (manipulatives and objects). When students demonstrate mastery at the concrete level, move to the representational (or semi-concrete) level. In this level, the skill is modeled and taught using drawings or symbols that represent the manipulatives that were previously used. Last, when students demonstrate mastery at the representational level, you are ready to move to the abstract level. In the abstract level, the skill is modeled and taught using only numerals and math symbols. Reminder- make sure you provide plenty of independent practice at each level!!! Here is an example of how I teach multiplication using the CRA approach. The math curriculum Equals by Ablenet and TouchMath both use this approach. Many of my students will not make it to an abstract level, especially in one year, and that's ok. They are still learning math skills and I can ensure that they are proficient at the concrete or representational level. Teaching with this approach has helped my students understand how and when to use the skill. When we are teaching real world, functional skills to students who have disabilities, this is the goal! They don't need to be able to complete a 20 problem worksheet. They need to know when they have to add to get a total price when they are grocery shopping or that they need to subtract when figuring out if they have enough money to make a purchase. Model, model, model. Please, just model. When you are trying to help those kiddos that are struggling, don’t give them a chance to ingrain errors from the beginning. Show them exactly what to do AND talk through your thinking. Talk through the barriers and struggles you hit when solving the problem and how you can work around them. Talk about how you know what steps to take. 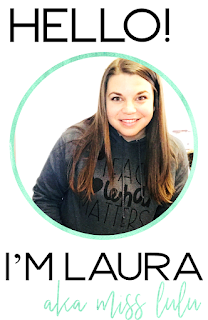 Modeling not only provides students with the correct way to solve a problem, but by modeling the language, you are providing them with a model of perseverance and teaching them how to think and talk about math. This may seem like such an obvious step, but I still find myself skipping over it. I am always finding jumping too quickly to guided or independent practice but when I ensure that I model the skill at each of the above steps (concrete, representational and abstract) my students are so much more successful. It's important to be intentional and include modeling in your lesson. 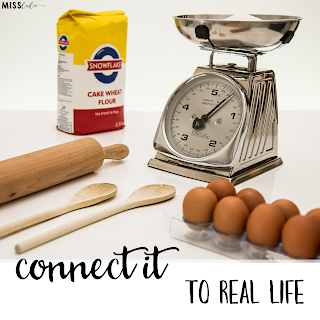 Connect it to real life. Students that struggle with math generally don’t understand why they need to learn the skills. Connecting the concept to real life not only provides a rationale but also allows them to practice the skill in their daily life. It takes a bit more effort but you can make most math skills functional. I start by asking myself, "When will my students need to perform this skill?" When do I solve multiplication problems in real life? When do I need to understand greater and less than in real life? This gives me a ultimate goal and it's easier to break the concept into teachable parts if I know what my end goal is. Plus, is there a better way to stress the importance of a skill than to actually see how we use it in our lives? Hopefully these strategies give you some ideas to help your struggling mathematicians. See ya next time!